Q & A – Where did our North Korean Bible translation come from? The North Korean and South Korean languages are over 40% divergent, making it difficult for a North Korean defector to read a South Korean Bible. This is one of the reasons why we produced a North Korean Full Bible and a brand new North Korean/South Korean Parallel Bible. But how did we get our hands on a North Korean Bible translation? Our goal wasn’t to produce something on our own, nor did we want to do a paraphrase or adaptation of an existing work. Instead, the goal was to use the most linguistically and theologically well-regarded translation of the Bible in the North Korean dialect. Surprisingly, this was a work commissioned by the North Korean government through their Chosun Christian Association. The Chosun Christian Association runs the NK state church and also helps to create the outside appearance of freedom of religion in NK. 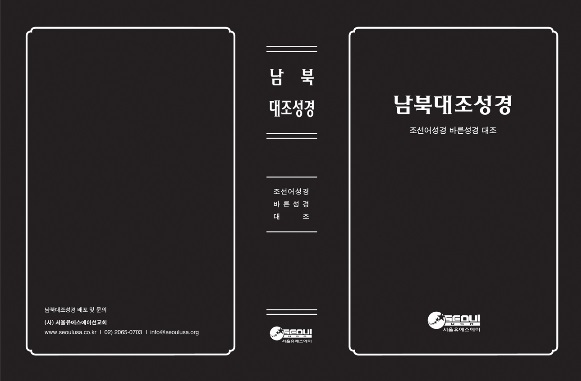 They produced the Common Translation (Pyongyang Version), which was based on the Common Translation Bible published by the Korean Bible Society in 1977. The Korean Bible Society focused on making a translation for the unchurched and refrained from using “church” language which would have been found in the Protestant and Catholic Churches at the time. The North Koreans printed 10,000 New Testaments in 1983 and 10,000 Old Testaments in 1984. The 2nd edition of the North Korean Bible was published in 1990 with both the Old and New Testaments contained in one volume. This was printed by the Pyongyang General Printing Factory with the help of the United Bible Society in China. Instead of making a separate Bible translation, they decided to make small corrections and changes to the existing translation. One of the goals of this 2nd edition seemed to be a focus on preserving the original common translation. When we produced the two North Korean Bibles, the only change that we made was to replace the North Korean “Hanulnim” (God of the heavens) with the Protestant “Hananim” (one true God). Hallelujah! 24,000 North Korean defectors came to South Korea seeking not only freedom, but also to pray earnestly and fervently for the freedom of those still in North Korea – an event that will come with reunification. Seoul USA’s Bible brings the hope and assurance of salvation to those who yearn for their loved ones still in North Korea. Defectors face many difficulties in their attempt to adapt to a new culture, a primary one being the language gap. As defectors come to know Christ, they face difficulty when trying to understand the Bible. This is because the Bible is published for South Koreans, and North Koreans need a translator to understand the language and meaning of the Bible. Therefore, the North Korean Bible has proven extremely helpful in understanding the Word of God. Please pray for each and every NK defector who receives one of these Bibles, and also pray for the safe passage of each and every Bible that we send back into North Korea. Though the cost of the Bible itself is covered, if you would like to make a donation to the ministries of Seoul USA where needed most to help us put the Bible to good use in all of our various fields and projects, click here! This entry was posted in Bible, North Korea and tagged North Korean Bible, North Korean Bible translation, Seoul USA. Bookmark the permalink. 2 Responses to Where Did Our North Korean Bible Translation Come From? Please let us send prayers and hopes to those who are sending balloons from the borders of North and South Korea that they will reach those in urgent need. We hope also that funding will be found for the North Korea Reform Radio for it to carry on the good work for the Defectors. Thanks for your note Rosa and I pray that the example of NK Christians spur you on to more growth in Christ!